The Long Meadow is part of our farm which has been owned by the McKeever family for three generations. Through our stewardship, we have focussed on Bramley apple production, but each generation of our family has also had a policy of growing a mix of varieties and using different planting processes to further refine the apples we use. Each generation has passed on different methods and traditions to the next; from Peter (Senior) to Patrick to Peter (Junior) in order to grow and produce the perfect apples on our home farm. 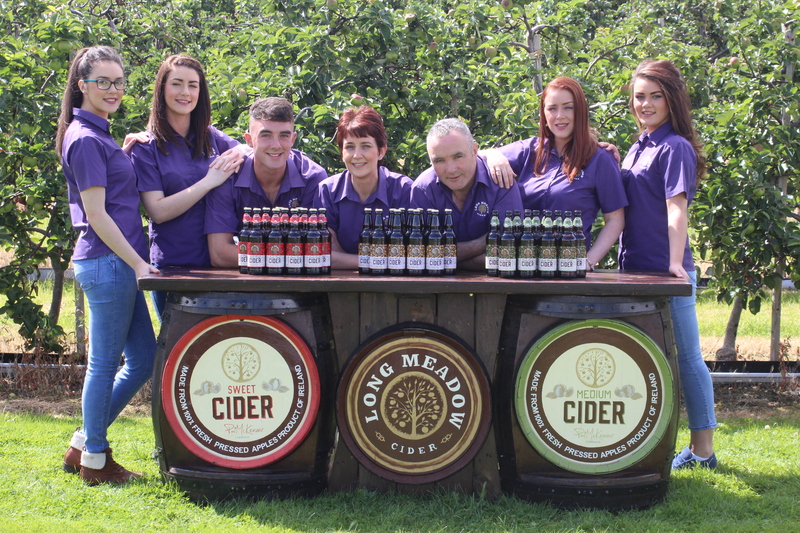 Our cider is pressed and fermented naturally by both father and son; Pat and Peter McKeever. For many years, the orchard in The Long Meadow was known locally for the quality of its Bramley apples. In addition to all of the wider benefits enjoyed by County Armagh, The Long Meadow has an added advantage of being right beside the waters of the Upper Bann river. This river which is the longest in Northern Ireland, rises in the Deer’s Meadow in the Mourne Mountains (the meadow itself nestling under Slieve Muck). From there it flows into Spelga Dam, before meandering past The Long Meadow on its way to Lough Neagh, from there becoming the Lower Bann, which reaches the Atlantic Ocean beside Castlerock. When in flood, the Upper Bann has long provided silts and minerals to the lands surrounding The Long Meadow, which gains, in our opinion, an intangible benefit to the trees growing on our farm. More obviously, its waters permeate our soil, this in effect being the water of life to our trees. For many centuries, apples have been selected for particular properties of yield, season, flavour and use (eg eating, baking, cider production). When a new variety is discovered or bred, new trees are propagated by grafting, a skilled technique where the desired apple type is ‘spliced’ into a rootstock of predictable vigour and strength. Our oldest apple trees are planted on M1-11 rootstock. These are vigorous growers where mature trees achieve a height of 15-20” (4.5-6m). Each tree can carry up to half a tonne of apples, but they are costly to prune, pick and manage. We have recently replaced 12 acres of orchard with trees on M9 rootstock. This is a much more restrictive sort which limits the growth and height to no more than 8’ (2.8m). These trees are much easier to look after and are planted a lot closer together. In an acre of M9 apples there can be up to 1400 trees. Where these trees are planted so densely, a new method of supporting them is using trellis posts and wire, instead of individual stakes. This system of growing is often referred to as Fruit Wall. We currently have 12 acres planted using this method of which can grow up to 1200 trees per acre. When the McKeever family first became involved with apples, it was common practice to use oak barrels as a means of storage. Some three generations ago, a consignment of surplus barrels was sold to a well known distillery company to age whiskey. Jumping forward a number of decades, when we decided to move into oak aged cider, by pure chance, this same distillery company happened to be selling some surplus barrels. These were delivered to Long Meadow and only when we examined them, did we discover that they were the barrels that Peter McKeever(SNR) had originally sold to them! The business, which was established in 2013, has grown from strength to strength and is blossoming with success. The awards we have received over the last three years are a result of an ambitious diversification programme by both Pat and Peter. We take care of the apples from pruning through to blossom and harvest and right up until the finished cider product is delivered to the customer’s premises. Our experience has been extended beyond just quality apple production, and our move into cider, apple juice and cider vinegar has been accompanied by a significant level of research and development. We only use pure pressed apple juice; we do not use concentrates, chemicals, or added water which we understand some bulk producers of cider and/or juice in Ireland and other countries have been claimed to do. Most importantly, before refining the optimal blend of apples to be pressed (which differs for each of our products) we carefully test for any taste variations. Each apple can be affected by obvious factors such as the amount of sun or rain, but frost and wind can also impact each harvest. We carefully allow for this in the blend to be pressed. Equally, apples that we source from a selected number of nearby trusted growers require similar sampling before they are moved onto the pressing process. Our expertise and the skill of our team is judging the flavour of the Bramley harvest, and then optimising the blend of other apples which we use to adjust the “edge” of the pure Bramley juice, which some find a little tart. We also decided at an early stage, not to use windfall apples which can start to degrade with an obvious mpact on the end product. This all costs more from a production perspective, but we consider is more than offset in the flavour and quality of our products. All of these, from cider, through juice, to cider vinegar, are craft based; so one blend is not always exactly the same as the next, but they all demonstrate the quality of the apples we use. Through all of this, we hope that you will see that quality is our watchword. We produce in smaller quantities as we have a slow fermentation process (between 4-6 months), resulting in each bottle being an ambassador of Long Meadow Cider, Apple Juice, or Cider Vinegar. Not only do our ciders tickle your taste buds but they can also be used during cooking. We often cook with our cider (a Christmas ham tastes deliciously different when baked in our Medium Cider) local chefs also used our Blossom Burst Cider to make custards and sauces! The blossoming of each bottle! We produce three main types of cider. The largest sellers are our Medium and Blossom Burst, with the more limited volumes of Oak Aged Cider that we press appealing to a more discerning customer (it taking longer to produce anything from 18-24 months so consequently is only available in smaller quantities). The taste of each cider has been refined initially through in-house taste-tests, but customer feedback was also taken on-board in the early stages. Subsequently, awards and comments from judges have confirmed that the decision to use solely Long Meadow grown and selected apples, and reject apples that have in any way degraded (windfall apples) has resulted in a differentiated and high quality end-product. We have won an increasing number of awards and these can be found in various blogs in Our Latest News Section and also on our Facebook and Twitter pages. This success is equally being reflected in our range of apple juice and apple cider, both of which are comparatively recent additions to our range.